About the orchard … and the farmers! Our goal is to provide you with the best quality produce and the best possible customer service. We will do our best to make sure you leave the farm happy and with no unanswered questions! Dan and Karen purchased the orchard in 1999. The orchard is located in Dillsburg, Pennsylvania. They farm about 150 acres of mostly apples, peaches, nectarines, plums, blueberries, and pumpkins. Dan grew up on a farm in Mechanicsburg where he and his siblings grew potatoes and sold them out of the barn next to their home. As a child he thought it would be great to have enough children to have his own baseball team! Karen grew up in the suburbs…always longing for the country and dreaming of owning a horse and other animals. As a child, Karen didn’t put much thought into how many kids she wanted…she was more concerned about saving every animal she saw and was known for bringing home all kinds of critters. 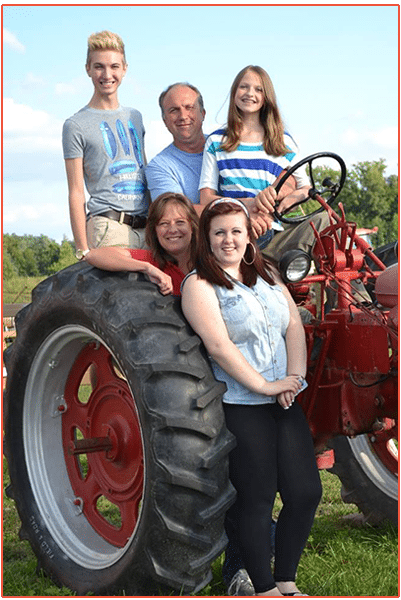 After high school, Dan went to Delaware Valley College, getting a degree in agri-business. Karen graduated high school and started attending Penn State. Once they were hours apart they thought it would be a good idea to start dating….did I mention they lived in the same town beforehand but didn’t date then? And cell phones and internet were not around yet! After Dan graduated college, he started working for Perdue Farms, in Salisbury, MD. Dan and Karen were married and Karen finished college at Salisbury State University graduating with a degree in chemistry. For several years Dan worked in sales and Karen taught high school chemistry. They made the big leap to move back to Pennsylvania and purchase the orchard. Dan is living out his dream of owning his own business and working outdoors. Karen was home with their 3 children while they were young and then worked part-time for her church and as an adjunct at Messiah College. Karen never got that horse but she’s also living out a dream and couldn’t be happier. Back in 1999, they had a very simple farm selling peaches, nectarines, and apples. The season was short, one employee in the stand was plenty, and they didn’t even have a cash register! Change was made out of the pockets of an apron and credit cards were not even an option. Things have grown and changed a lot since then. They grow a larger variety of fruits – adding plums, blueberries, blackberries, raspberries, strawberries, and pumpkins. Credit cards are most definitely accepted. And the farm now offers educational school tours, pick-your-own fruits, birthday parties, festivals, corn maze and PlayLand, and a commercial kitchen where they make lots of homemade treats. Dan, Karen and all of the staff at Paulus Orchards look forward to having you visit!